For those planning a visit to Piraeus, where to stay and what accommodation to choose really does depend on your itinerary. There are some reasonable hotels in Piraeus, although it has to be said that the selection of lodging on offer just next door in Athens is far superior. 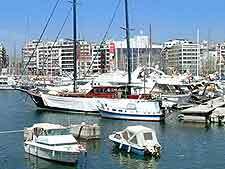 There are a number of adequate hotels located around the Great Harbour in Piraeus, although these do tend to attract sailors rather than actual holiday makers. The more upmarket accommodation in the city is again aimed at a different market, targeting business visitors, such as the Savoy Hotel on Iroon Polytechniou Avenue, which is situated conveniently close to the docks and the exhibition centres. 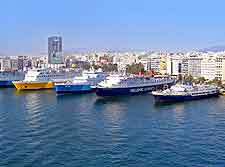 For tourists staying in Piraeus, there is a fairly limited choice of good hotels, with the most popular including the Hotel Ideal on Notara, which is just a relatively short walk from the beachfront and the city centre, residing in the southerly suburbs. Also worth considering is the reliable Best Western Park Hotel on Kolokotroni Street, where accommodation enjoys a central position in the commercial district and close to countless shops, with guest rooms enjoy views across a small park. For budget lodging in Piraeus, the Hotel Glaros on Charilaou Trikoupi is hard to beat, featuring two-star air-conditioned accommodation in the heart of the city. The Noufara is another cheap hotel and stands on Iroon Polytechniou Street. For families holidaying in Piraeus, the appropriately named Super Paradise is amongst the best hotels and being on Kapodistriou Street, is right next to the sea and the sand. 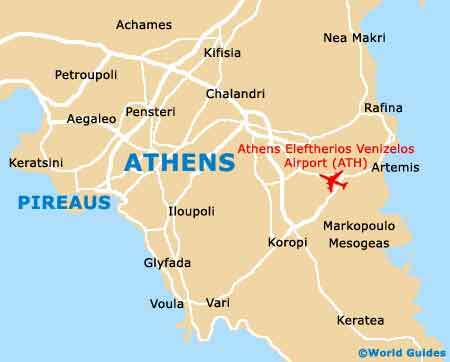 Little more than a matter of minutes away from Piraeus, the accommodation scene in Athens is huge business and hotels here have been greatly revamped in the past decade, for when the city hosted the Olympics. Many new chic 'boutique' style hotels have opened in Athens in recent years and whilst few are what you would consider cheap, the standard of accommodation is very high. 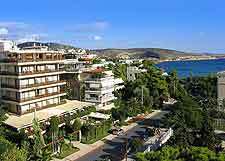 More information about Athens Hotels.